Looking for a live phone call and webmeeting to interact with an experienced Jive Professional Services team member? Want to meet some of your fellow ECMs (Enterprise Community Managers)? Have a burning question and you're too shy to ask it here, or you want your answer in real time? Just want to learn more about Jive and how it's used in our communities? Come join the weekly "Ask a Consultant" Zoom webmeeting call !! From the Jive Adoption Resource Center, sponsored by the very awesome Darren Phillips and led weekly by the most very awesomely knowledgeable strategists Ms. Michelle Gantt and Ms. Becky Dozier comes this weekly webinar call where ECMs new and tenured speak together for an hour about best practices for our Jive communities. AT NO EXTRA COST TO YOU!! Come with your questions, or post them in advance in the weekly Event posting. All Jive customers are welcome! Check out this listing of upcoming sessions. RSVP to the next session and then from actions menu, choose "Add to calendar"
Got a question? Add it as a comment to the next event in the upcoming session list. Yours will have priority in the agenda of questions and discussion topics. But Mike O, why are you promoting this call? You're just a customer! Exactly! Come and join me and our fellow ECMs -- AND most experienced Jivers from Jive Professional Services -- in a spirit of "giving" freely of our knowledge and experience to each other! That's what this platform is supposed to be all about, right?! The Community Roundtable State of Community 2019 Survey is now open and you can help make sure your voice is represented in the final research report. *Data taken from the State of Community Management 2018. Engage Dialog announced a new partnership with TemboSocial, a leading provider of social software solutions for businesses today. This relationship means we’ll be working very closely with the TemboSocial team to identify new and exclusive ways to benefit Engage Dialog customers. Our partnership will help customers leverage their Jive investment by driving sustained platform adoption and employee engagement. TemboSocial's add-ons are easy to use for Jive customers who are looking to introduce programs which encourage active participation for employees in the organization. This brings an advanced level of dialogue to the social environment making organizations more competitive and productive. Their software helps recognizing employee achievements and reinforcing company values. You can create badges and other achievements to boost your employee engagement. With their collaboration software you can generate and share ideas. Or use their polling and survey tool. 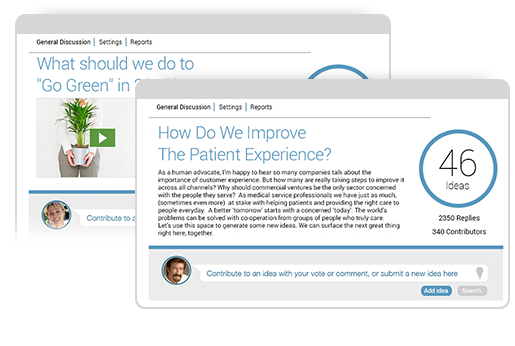 With this you can create rich, multi-question Surveys, Forms, Polls, Quizzes and Learning & Development modules that engage, educate and drive your audience to deeper content pages. Founded in 1999, TemboSocial already works with big Jive customers, such as Royal Bank, Ricoh, New Relic, and Publicis.Sapient. Leading companies turn to TemboSocial’s hosted suite of tools to foster collaboration, innovation and recognition among employees, customers and prospects. To learn more about TemboSocial, visit http://www.tembosocial.com/jive. As European partner of Jive Software, Engage Dialog helps organizations collaborate using modern technology and experienced community managers. By connecting people and organizations online, they create powerful networks that lead to engaged customers, partners and employees. To learn more about Engage Dialog, visit www.engagedialog.eu/en. As a system admin of Jive one of my least favorite things is going into the System Admin dashboard and dealing with some of the archaic interfaces that are generally very frustrating to use, but don't get much love over time since a very small group of people ever see these screens. So we deal with it and don't complain much, but THE WORST is when someone in your community deletes a document in the open space of your Jive instance, and wants the System Admins to restore it. Why? Because the interface to find a document that has been deleted is a list of every single document ever posted to Jive listed 10 at a time by day with no ability to sort or filter that information. AND THE worst part is there is no way to JUST see DELETED items so you need to scroll through 100s of pages of documents to find the one that someone decided to ignore that "are you sure" warning, and delete it anyway. Even if you scroll through every single day I have found sometimes I never find the document. Until now......! Every deleted document still exists in Jive and to system admins it will show a message to admins letting them know if they want to restore it they can go to the horrible Document Management interface above and restore it. As discussed this is easier said then done. You can't restore a past version since that will lead to an error, you can't edit the document and republish it, BUT YOU CAN MOVE IT! If you move a document out of a Jive social group or an open space to a private hidden space that has very little documents in it (I recommend even making a hidden space for just this purpose), THEN BOOM you can then filter the documents by selecting change space (or in my example "community" in the first screenshot) in the upper left of the Document Management interface. You will then ONLY see documents located in your special hidden "Lost and Found" space and instantly find your DELETED document in it! Then you can restore the document from there, and MOVE it back into the old social group or open space. We ,at ThoughtWorks, have created bunch of custom tiles and would like to share the learnings/implementations of the same. We have used 'Tiles' feature of Jive to make sure the information is shared in an intuitive graphical way. What do the fields in the config UI refer to? We have built this tile using React. This is a quick post to share an idea from Keeley Sorokti. We've been working on ways to get more people to not only download Jive for Office, but to understand how easy and useful it is. Keeley settled upon using an activity that we all love to do - co-create a summer reading list. Thanks, Keeley, for this idea that is getting so many people excited about Jive for Office! TemboSocial has released Ideas, a robust Idea Collaboration Add-On for Jive. Multiple Idea discussions can run simultaneously on any page within Jive. Page owners can easily add and configure their own idea discussion to immediately solicit ideas with their group or team on any subject. Experts and Moderators can be added directly from the Settings tab. TemboSocial Ideas enables experts and moderators to curate the best contributions and update the activity state to reflect when an idea is closed, under review or graduated. The best ideas don't always come from one person. 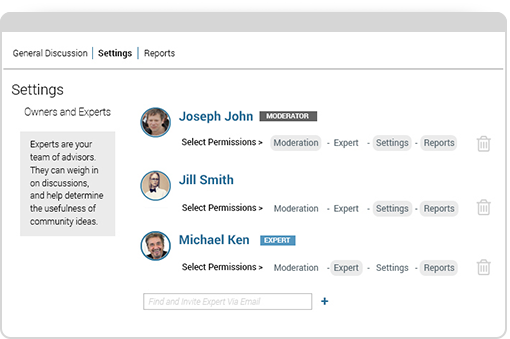 Empower participants to shape the conversation, surface meaningful content to others and contribute sentiment data to the reporting algorithm that will identify the most valuable ideas for each discussion. 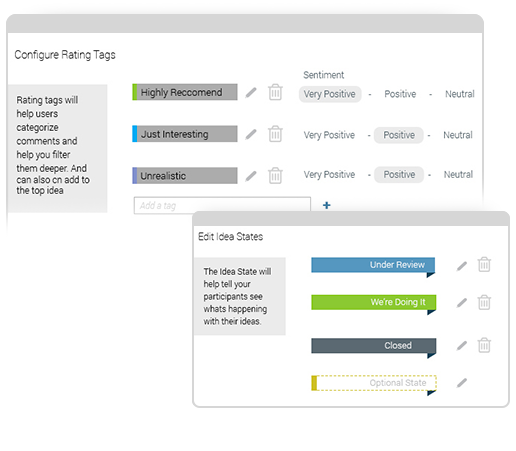 Participants can filter between Top ideas, Trending ideas, Recent ideas or by the current review status. 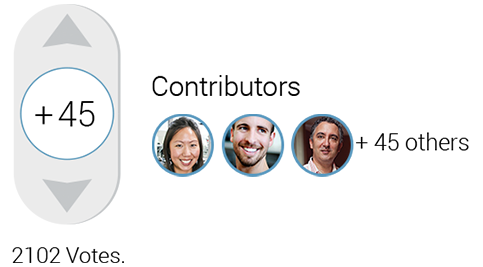 Easily keep track of all ‘Your Stuff’ where you are a contributor to an idea discussion. With Ideas you can leverage the crowd to do much more than just vote for the ideas they like. 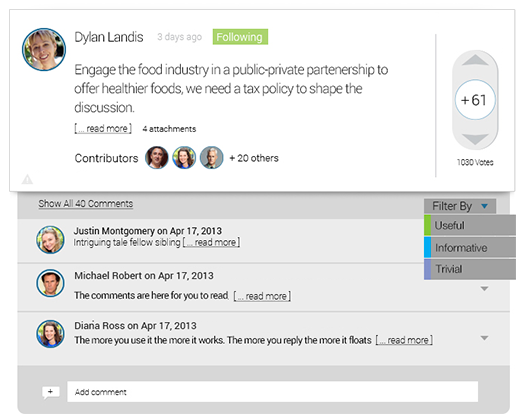 They can also classify comments submitted to each idea with social tagging. Advanced algorithms reduce duplicate ideas. Fewer duplicate ideas contributes to higher levels of activity since there is less annoying repetition. Addressing duplicate ideas also ensures that energy of a great idea is not watered down across multiple discussions. 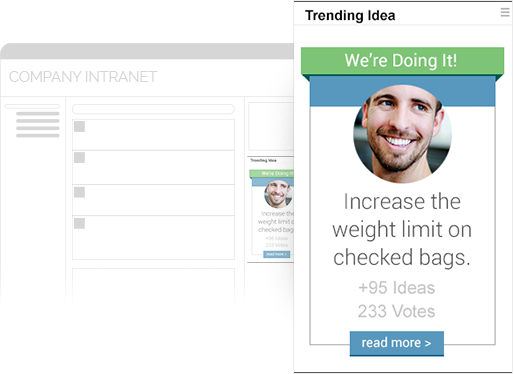 Add dynamic Ideas widgets to any page of your Jive site. Banners drive traffic and increase participation in your online conversations. The user interface brings a contemporary feel to your idea discussions, and fits perfectly into any Jive page. When your internal tools work and feel like the social tools your employees use outside the office, you are able to boost participation and foster a culture of innovation. TemboSocial’s latest innovation is called Enterprise Admin for Surveys, Forms and Polls. Enterprise Admin introduces individual user account access where you no longer need to share access with your colleagues, manage folders or have others view your projects. With TemboSocial Enterprise Admin for Surveys, Forms and Polls, you can have your own personal account, create and report on your own content, and publish directly to any Intranet page without needing IT support. 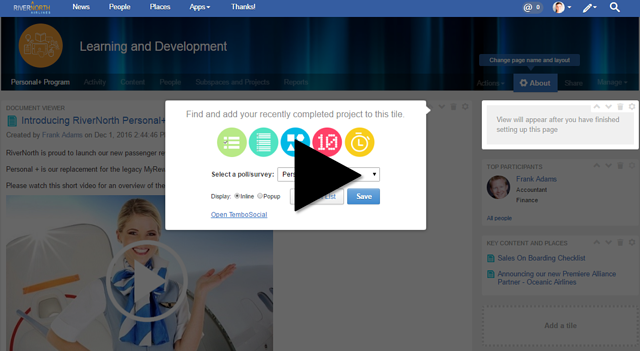 You can also build project teams and collaborate with colleagues to edit, publish, or view the reporting. See how it works in the short video below. TemboSocial Surveys, Forms and Polls is now available from Jive and can be added to your existing contract. Ask your Intranet team if they are planning to upgrade to TemboSocial Enterprise Admin or contact your Jive Rep for more information. Workaround - (Depending on your version and implementation of Jive.) When encountering an image float issue consider the following to help improve your content presentations. There are pros and cons to each and this simply documents a few simple steps you can try on your own. Use this for Jive documents or blogs. Anytime you want to 'float' an image left or right of your text. Need something to float right, then select Align Right instead. A simple example of how this workaround will work and display. May not work in all situations and may impact how people view the content in streams, mobile or email. This suggested work around may also be impacted upon a new Jive release or if the editor UI gets updated, i.e. you may need to revisit your content and fix it. Breaks - in typical html after an float has been added a clear float would be needed to ensure content sections are clearly separated. A simple <br style="clear: both;" /> may work. No need to keep hitting return to create space. Use this for Jive documents or blogs. Anytime you want to 'float' an image left or right of your text. No floats needed. Step 1: In the editor tool set, click Table. Create a 2 column table. Step 2: Make sure your table is set to 100% in the Table Properties and that your columns are set to 25% / 75% in the column properties. (this is to help ensure your layout scales and is not cut off when viewed in smaller screen sizes. Step 3: Add your image in the first cell, THEN add your text in the second cell. In the cell property click align top. DO NOT: Click on image to resize OR click on a column to adjust. This will set the table back to pixels, thus breaking the auto resizing when viewing in other screen sizes and the document viewer. This must remain percentage based. Using a table might be another way to present your content and images. The drawback is understanding and dealing with a few 'quirks' with the table itself, depending on your editor. As stated above this option may obsolete once the issue is fixed, however you can use this method anytime if it is of value to you. You determine how to best represent your content. Knowing when to put just the right amount of text in relationship to the image is your choice. This just illustrates some options you may want to implement if you are struggling with layout issues. Many can recognize that the float issue should simply be fixed, rather than providing workarounds. However until the issue can be corrected and properly addressed the above suggestions may work for you - we all use various Jive instances and may experience the same or similar issues. 41 ways to spark collaboration! Hi everyone, hope you had a great Easter break! Ours was filled with lots of Easter fun with the kids, visiting parks and zoos collecting eggs and having lots of fun. As we ran between hedges a glimpse of collaboration flashed before me (sadly) and it got me thinking about the process of egg hunts and how comparable it was to how we find, or don’t find, answers in LBG. When we started the hunts we were given a map of the area that outlined the egg zones we’d be hunting in - of course the actual egg locations weren’t on there, we’d have to find them ourselves. As we hunted through vegetation there were plenty of misses and plenty of false egg sightings with high hopes raised and dashed but we kept going, confident that more chocolate was out there! We made a lot of progress at first but as our eggs increased the time between findings became longer and longer. We asked the staff if there were any more, at times different people pointed out areas that could be the right ones only to find they’d been looted already or they’d just say ‘sorry I didn’t put them out’. We kept going hoping for more until eventually we decided we’d got enough, or had enough, and it was time to get eating. So how does that compare to how we find answers in this business? We start with our rough map, Interchange, bringing us through divisions and departments in the hope that the information is stored hierarchically and we already know under what team we’d find it. Just let an egg hunt, eggs locations change for each hunt and so do teams and structures, making finding the right team a real challenge. We look around the teams we think might be right only to find the answers aren't there, so we try somewhere else with a trial and error approach and that doesn’t work out either. We try asking other egg hunters, checking search for more the right answer. Loads of suggestions come back, we look into those and there’s similar things but not the egg were looking for. So we approach the egg hunt staff, usually a mailbox for a team we don't know. We wait a few days to hear back only to be told that they don't know where the egg is but they know the egg layer. We contact the egg layer who says they actually just planned the egg hunt laying. The actual layer is somewhere else and to ask the egg laying team if they know more. We ask the egg laying team and finally find the layer and we find our egg - hooray! We scoff that egg straight away and don't tell anyone else that that's where the eggs are. An answer found and a success for business? Yes, except for the amount of time and resources it’s taken to resolve it. We collaborate to avoid these problems by making what we do less hierarchical, more open and discoverable. Instead of organizing information into hierarchies, it's organised into interests that we actually look for - Egg Hunt groups, not Zoo owners > Marketing teams > Activity teams > Egg Hunt setters > Egg hunt layers. Instead of the information being buried, it's made open so others can discover it through search and self service the answer, saving everyone time. And when the answer can't be found, it's open to others with similar interests to support it. They can point us in the right direction and to the people that know the answer. That all saves time, energy and effort and is a cornerstone to why collaboration is so important. It cuts out the hunting and gets us to the outcome, fast. That makes us more agile, more responsive and ultimately more secure as businesses of the future.